Mazda has rolled out the first images of the wagon version of the Mazda6 sedan. The new Mazda6 has been front and center as of late, with the sedan version having made its official debut at the 2012 Moscow Motor Show only last week. Today, the just-released touring wagon variant has been revealed before it heads to Paris later this month for its live unveiling. 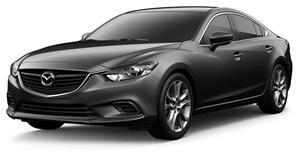 The Mazda6 Touring Wagon is slated to run on the sedan&apos;s lineup of engines, which include a pair of four cylinder SkyActive gasoline engines. There could also be further choices for the world market in the new wagon. The two gasoline plants we do know of are a 189-horespower 2.5-liter version and a less powerful 2.0-liter 148hp plant. A rumored 2.2-liter twin-turbocharged SkyActive-D diesel engine with either 150- or 175-horses is expected to be available solely for the European market. Mazda has chosen to keep most of the wagon&apos;s exact details under wraps until it debuts in France on the 29th, however the estate does feature a more slanted design in the rear leading towards the tailgate along with a lower rear bumper for easier loading and unloading. What remains to be seen is exactly how much cargo room the new Mazda6 Touring Wagon will offer along with its exact dimensions and tech.